Product prices and availability are accurate as of 2019-04-19 21:36:35 UTC and are subject to change. Any price and availability information displayed on http://www.amazon.com/ at the time of purchase will apply to the purchase of this product. The Danby DBC120BLS 3.3 Cu. Ft. Beverage Center is the perfect teammate with those big sporting events. When friends and family stop by it's always good to be prepared to serve up some cold beverages while watching a game or just enjoying the company. No matter what event keeps those guests ever-present, this beverage center will be a great asset. With a 120 can storage capacity you will be sure to never be short on ice cold beverages. The tempered glass door and stainless steel trim add an elegant touch to any decor.Package Content: 3.3 cu. 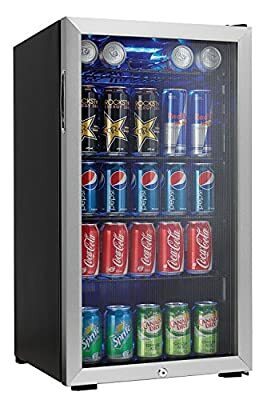 ft. beverage center;manual;warranty;Tempered glass door with stainless steel trim;Recessed side mount door handle;Integrated lock with key; Interior light illuminates compartment when door is opened; Color - Black with Stainless Steel; Height 33.70, Width 17.87, Depth 19.75, Weight 68.90. Color -Black/Stainless; Manual Language: English, Spanish, French; Assembly Required. From the Manufacturer The Danby DBC120BLS Silhouette 3.3 Cu. 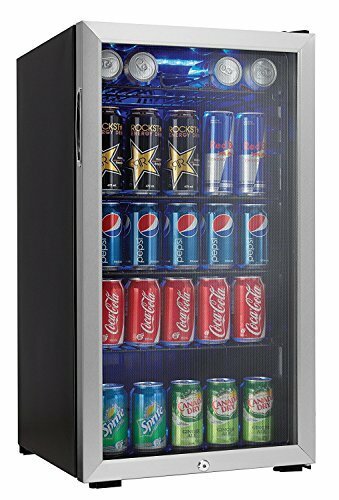 Ft. Beverage Center, in black/stainless steel, is the perfect teammate with those big sporting events. You need to be ready for the friends and family who stop by to visit your flat screen TV. Whether it's the Olympics, football or hockey finals that keep those guests ever-present, this beverage center will be a great asset. With a 120 can storage capacity you will be sure to never be short on ice cold beverages. The tempered glass door and stainless steel trim add an elegant touch to any decor.